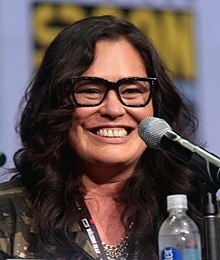 Rachel Jessica Te Ao Maarama House ONZM (born 20 October 1971) is a New Zealand actress, acting coach, and comedian. House was born in 1971 in Auckland, New Zealand and raised in Kamo, Whangarei, by her parents John and Sheila House. She is of Māori (Ngāti Mutunga and Ngāi Tahu) and European descent. House attended the New Zealand national drama school, Toi Whakaari, graduating in 1992. From here she went into stage work with Pacific Underground Theatre and Auckland Theatre Company. In 1995, she won the Chapman Tripp Most Promising Female Newcomer of the Year Award for her performance in the one-woman show Nga Pou Wahine by Briar Grace-Smith. This was followed by other awards in 2002 (Most Outstanding Performance) for Witi Ihimaera's critically acclaimed Woman Far Walking (in which she played the key role of Tiriti, a 160-year-old woman) and 2003 (Best Supporting Actress) in Henrik Ibsen's An Enemy of the People. She has acted in several major productions that have toured both nationally and internationally, including Hone Kouka's Waiora, Carol Anne Duffy's The Worlds Wife and the UK/New Zealand co-production of Beauty and the Beast. House's film work has included roles in Whale Rider, Eagle vs Shark, Boy, and White Lies. Her television appearances include Maddigan's Quest and Gaylene Preston's series Hope and Wire. Jason Buchanan of the Rovi corporation says of her "While she may not necessarily possess traditional Hollywood good looks, House has an undeniably distinct persona onscreen and exhibits just the kind of charisma that could prove the foundation for an enduring career." In 2016, House appeared in Taika Waititi's feature film Hunt for the Wilderpeople. The film became the top grossing New Zealand film of all time at the New Zealand box office. House voiced the character of Gramma Tala in the 2016 Disney animated film Moana. In 2017, she played Grandmaster's bodyguard Topaz in Thor: Ragnarok. House is a frequent collaborator of director Taika Waititi, acting in four of his films (Eagle vs Shark, Boy, Hunt for the Wilderpeople, Thor: Ragnarok) while also serving as acting coach for the young actors on Boy and ... Wilderpeople. She also worked as acting coach in Everything We Loved, The Dark Horse, The Rehearsal and the second season of the series Top of the Lake. House has directed several theatrical performances, winning the 2001 Director of the Year award at both the Chapman Tripp Theatre Awards and the New Zealand Listener Awards for her direction of Mitch Tawhi Thomas' play Have Car Will Travel. House attended the Prague Film School in 2008 and was awarded Best Director and Best Film Audience Award for her two short films made while studying there. In 2010, House directed Kylie Meehan's short film The Winter Boy, produced by Hineani Melbourne for the New Zealand Film Commission's Premiere Shorts. In 2012, House directed the Māori-language version of Shakespeare's Troilus and Cressida, performed as part of an international series at London's Globe Theatre. For this she was awarded Production of the Year and Director of the Year at the Chapman Tripp Theatre Awards. Other theatre directing work includes the award-winning production of Hinepau, which House also co-adapted from Gavin Bishop's original book and toured both nationally and internationally, Neil La Bute's Mercy Seat and Hui by longtime collaborator Mitch Tawhi Thomas that premiered at the Auckland Arts Festival in 2013. In 2016, House directed Auckland based theatre company Silo Theatre's production of Medea, a contemporary retelling of the Euripides myth created by Australian theatre-makers Kate Mulvany and Anne-Louise Sarks. In 2012, House received the New Zealand Arts Foundation's Laureate Award, which is given as an investment in excellence across a range of art forms for an artist with prominence and outstanding potential for future growth. In 2016, House received the WIFT (Women in Film & Television) NZ Mana Wāhine Award for her prolific contribution to theatre and film, both in front of and behind the camera. In the 2017 Queen's Birthday Honours, House was appointed an Officer of the New Zealand Order of Merit for services to the performing arts. ^ a b c d e f g h i j k l m "Rachel House". 26 September 2015. Retrieved 26 July 2016. ^ a b "Kathryn Rawlings & assoc". www.kractors.co.nz. Retrieved 26 July 2016. ^ "Rachel House Biography - Fandango". Fandango. Retrieved 27 July 2016. ^ "Hunt for the Wilderpeople becomes largest grossing local film in NZ". Retrieved 26 July 2016. ^ Heath, Paul (25 July 2016). "Nicole Scherzinger, Jemaine Clement, Alan Tudyk & more join the cast of Disney's Moana". The Hollywood News. Retrieved 26 July 2016. ^ "Interview: Moana's Rachel House on Marginalized Voices in Hollywood and the Need for More Female Directors". www.themarysue.com. ^ Christian, Dionne (11 June 2016). "Hunt for the Wilderpeople's Rachel House on her new project". New Zealand Herald. ISSN 1170-0777. Retrieved 26 July 2016. ^ "WIFT New Zealand | Film and Television Industry News from Women in Film and Television New Zealand - WIFT NZ MANA WAHINE AWARDS FOR 2016". www.wiftnz.org.nz. Retrieved 30 July 2016. ^ "Queen's Birthday honours list 2017". Department of the Prime Minister and Cabinet. 5 June 2017. Retrieved 5 June 2017. "Rachel House", The Arts Foundation. Retrieved 22 June 2013. This page was last edited on 17 January 2019, at 08:11 (UTC).